Maru & Friends doll Jamie is a 52cm/20" all vinyl doll for play or collecting. 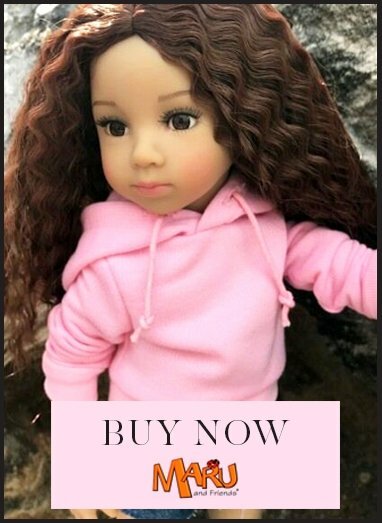 Magnificently crafted with unique child like facial features that look just like a little girl. She looks and feels like porcelain, but she is made with the finest materials for play. Jamie is a wavy blonde sweetheart with extraordinary green/hazel eyes. Her cute freckles accent Jamie's facial beauty. She comes in her featured white and pink ski outfit. Safety tested for children 3 years and over. Sculpted by master doll artist, Dianna Effner. Certificate of authenticity included. Honey- blonde curly haired Jamie is a Maru & Friends doll. Jamie is an American girl who Maru meets and Jamie comes with her own story book that takes you on Maru's journey through Latin America. Jamie is safety tested for children from age 3 but My Doll Best Friend recommends her to girls age 6 and above as her body is vinyl which makes her less cuddly than a soft bodied doll, therefore usually better for a slightly older girl. Her wigged hair requires a bit more care in the way it is handled than rooted hair does. Jamie's hair would be best cared for by a hair pik for curly hair which can be bought from a chemist. Maru & Friends dolls are very high quality play dolls, desired by collectors too.